"It was an awesome experience Delivery on or before time Products are too good as shown in picture Thanks to u ferns and petals ��"
Dum Dum Cantt is a very rapidly growing locality on the northern fringes of Kolkata. It is one of the largest residential areas there and is also historically important since the Indian rebellion of 1857 started from there. If you want to convey your love and affection to your close ones staying in Dum Dum Cantt area simply order online for flower, cakes and your gifts delivery in Dum Dum Cantt. We ensure you the most hassle free gift delivery solutions for your dear ones living in this region. Flowers can best convey our feelings no matter what the occasion is. 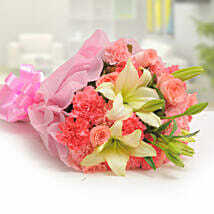 Even if you are unsure of what to send, flowers will be the cheeriest and safest presents that you can bank on. With our help, you can curate the loveliest of bouquets and go for flowers delivery in Dum Dum Cantt, to let those special people in your life know how much they really mean to you. If it is their birthday, then send a Birthday Cake too, along with vibrant flowers. A birthday cake is what everyone longs for. And we will travel all those miles to ensure that you can depend on us safely for the delivery of your gifts at their doorsteps. Ferns N Petals is the ultimate online gift shop when it comes to flowers and cakes delivery in Dum Dum Cantt. Not only do you get to pick from the most attractive flowers and delicious cakes, but you also get easy access to the widest range of unique gifts to Kolkata. Once we receive your order online, our secure and fast delivery network makes sure that all your wishes for those treasured ones are delivered to your chosen location. Ferns N Petals boasts of a fantastic track record of on-time delivery and assures you of the best online gifting experience ever.